MrBeast delivers on a promise ... kind of. YouTube creator MrBeast and his friends at the Super Bowl. The seemingly never ending battle between Felix “PewDiePie” Kjellberg and T-Series for most subscribed to YouTube creator just hit a whole new level. 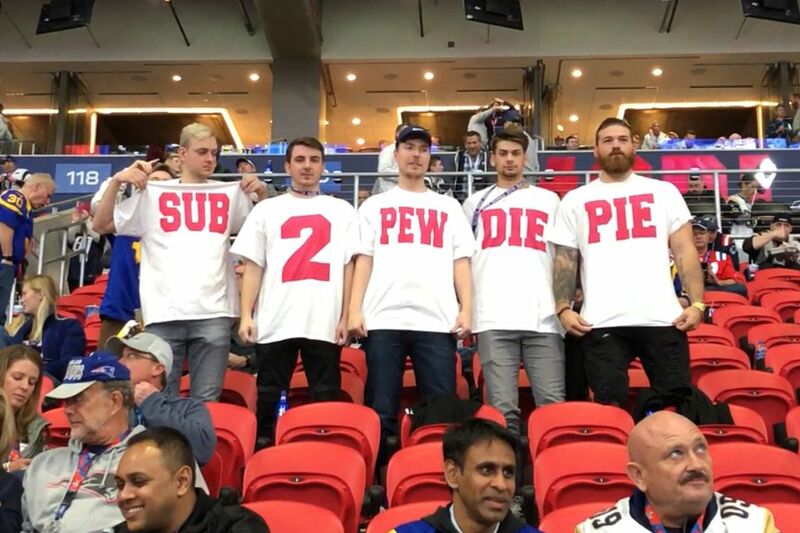 Jimmy “MrBeast” Donaldson, another popular YouTube creator, appeared at the Super Bowl with his friends wearing “Subscribe to PewDiePie” shirts, bringing the internet campaign to a whole new level. The shirts appeared a couple of times on stream, and even managed to make it into an official ESPN tweet, which can be seen below. Donaldson and his friends can be seen to the right. Donaldson also noted that because their seats are directly behind the Los Angeles Rams’ field goal, people should expect to see their shirts quite a few times during the Super Bowl game. It’s a level of mainstream attention that Kjellberg’s battle against T-Series has yet to see. Donaldson has been one of Kjellberg’s most vocal supporters in his mostly facetious battle with T-Series, an extremely popular Bollywood music and movie studio based in India. T-Series is poised to usurp PewDiePie as the most popular channel on the platform, but fans and creators have banded together to keep Kjellberg at the very top. Both channels have more than 80 million subscribers, and Kjellberg has managed to stay head by a couple of thousand subscribers in the past few weeks. He has also grown his channel exponentially since the battle started, adding an additional five million subscribers in one month. Other YouTube creators like Justin Roberts (best known for his work with Jake Paul’s vlogging unit, Team 10) have taken out ads in New York City’s Times Square, or have plastered walls all over the world with “Subscribe to PewDiePie” posters. Donaldson, best known for spending an exorbitant amount of money on friends, family, and stunt videos, joked that he would spend hundreds of thousands of dollars on a Super Bowl ad, but Kjellberg asked him not to in one of his videos. Attending the Super Bowl and bringing attention to the campaign this way is probably something that Kjellberg can appreciate without having to worry about YouTube creators spending a ton of money on a facetious campaign.